Waiting On Wednesday is a weekly feature by Jill at Breaking the Spine that spotlights upcoming book releases that we're excited about! It's a fun way to share with others the books that you're eagerly awaiting to be released and you are excited about. 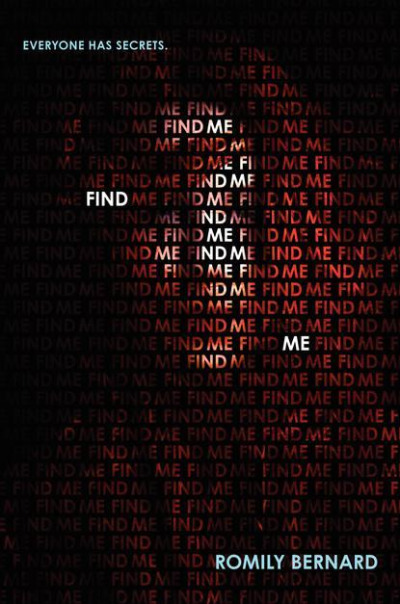 This week's pre-publication that "I-Can't-Wait-To-Read" selection is: FIND ME by Romily Bernard! FIND ME sounds amazing! I'm so excited for this book. Find Me just sounds so suspenseful to me. There's a killer on the loose, and a secret diary of a dead girl. Did I mention that the characters Wick and Griff are computer hackers? How cool is that. And the Romance? Yes...there's suppose to be some great chemistry between the two, and Griff, the boy next door, is suppose to be very Swoon-Worthy. As you can see, I'm pretty excited about the book, and I'm eagerly waiting on the release of Romily Bernard's young adult debut Find Me!